Island Conservation’s Board of Directors adopted this resolution to guide Island Conservation staff activities with the Genetic Biocontrol of Invasive Rodents (GBIRd) partnership. In 2012, Island Conservation engaged in a ‘horizon scan’ to identify the best potential new tools on the horizon that could help to increase the scale, scope, and pace of island invasive rodent eradications. The results of that scan are published in this paper and have led to our investments in research, monitoring and development of such tools. In the process of completing this investigation, we met like-minded NGO, government, and research university professionals who quickly forged an informal partnership to investigate genetic tools for conservation. This led to the formalization of the Genetic Biocontrol of Invasive Rodents (GBIRd) Partnership. 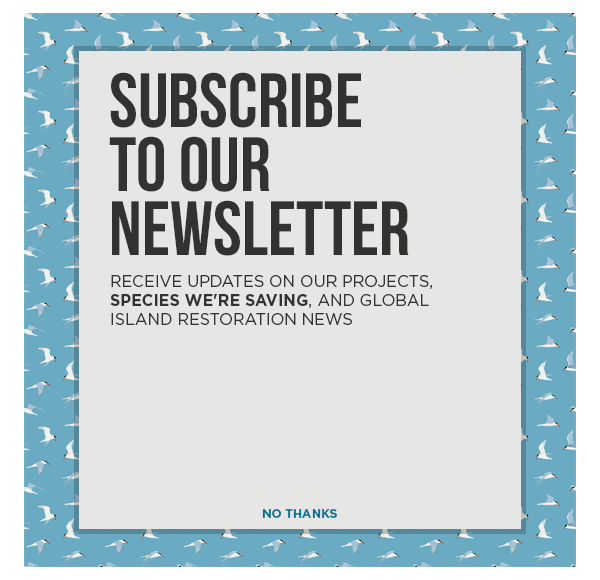 In 2016, Island Conservation’s Board of Directors adopted the following resolution to guide Island Conservation’s activities in the GBIRd program. Consistent with NAS recommendations for assessing feasibility and risks, the investigation will include extensive engagement of stakeholders from the outset to evaluate biological, social, and ethical risk, and engage governments with the most advanced environmental regulations to develop highly-controlled field trial(s) within robust regulatory frameworks. The results, findings, intellectual property and products of this endeavor shall be transparently maintained and made available to other non-commercial institutions committed to conservation, humanitarian, or other not-for-profit endeavors and the principles herein. Staff will provide the board with program and risk assessment updates as warranted and present drafts of a program partnership MOU2 and strategic plan for review and approval. Near the end of this investigation, staff will brief the board on the suitability of this tool together with social, ethical, ecological, and scientific risk assessments and current opinions of the world’s thought leaders (e.g. NAS, World Health Organization, World Conservation Congress, and United Nations) to the board’s satisfaction. After which, the board will determine whether to, or not to, pursue an application for the authorization of a highly-controlled field trial if recommended by staff and partners.